Recently a group of IDF combat soldiers from an unnamed unit claimed that they "have nothing to eat" when they return home from their bases. The letter was addressed to IDF Chief of Staff Lt. Gen. Benny Gantz, Defense Minister Moshe Ya'alon and Prime Minister Benjamin Netanyahu. The soldiers pleaded with Israeli leadership to provide extra financial support for combat soldiers in need. The IDF responded by stating that they put incredible resources at the disposal of the human resource officers in each unit in order to combat this specific problem. An IDF official also stated that, "We are aware of the problem of hungry soldiers in the IDF." Since publishing the letter, numerous high-profile individuals have stepped in to help the soldiers, including Israel's First Lady Sara Netanyahu. On the ground, one particular organization that is spearheading the drive to help IDF soldiers in need as well as many others who are suffering from financial difficulties is Karmey Chesed. Karmey Chesed is a non profit organization which receives donations of furniture, food, and money and distributes it directly to those who need it most. In this instance that meant sending it to the soldiers. In the most recent push to help soldiers in need, Karmey Chesed brought packages of food to army bases and provided home furnishings - everything from basic chairs and tables, to beds and bookcases - to numerous soldiers who have nothing at home for themselves or their families absolutely free. "We do everything we can to help our soldiers," said Aryeh Weingarten, founder and director of Karmey Chesed. "Thankfully we were able to furnish the houses of over 15 soldiers, who until we were able to step in had little or nothing to live with at home. We have been very involved with helping soldiers in need for a long time now, and we continually make every effort to help them in any way we can." The soldiers come from a variety of backgrounds, all of them from underprivileged families, and a number of them from Ethiopian descent. In Israel, many soldiers from the Ethiopian community come from a low socio-economic background. During the current push to help soldiers, Karmey Chessed was able to help many Ethiopian soldiers in need. "We are proud to be able to help these soldiers and their families," said Weingarten, "especially around the time period of the holidays. Nobody should have to go wanting, especially not soldiers, and especially not during the holidays." The current drive on behalf of Karmey Chesed comes only weeks after the organization donated hundreds of food and gift packages to soldiers who returned from fighting in Gaza during Operation Protective Edge. 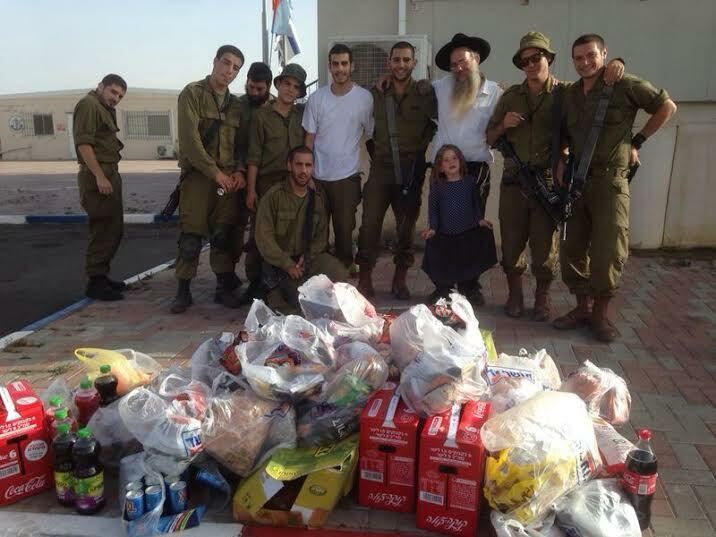 Karmey Chesed has taken upon itself to keep helping as many soldiers in need as they possibly can.